The XD® Mod.2® 5" Tactical Model packs 13 rounds of .45ACP ammo in each of its two included stainless steel magazines. 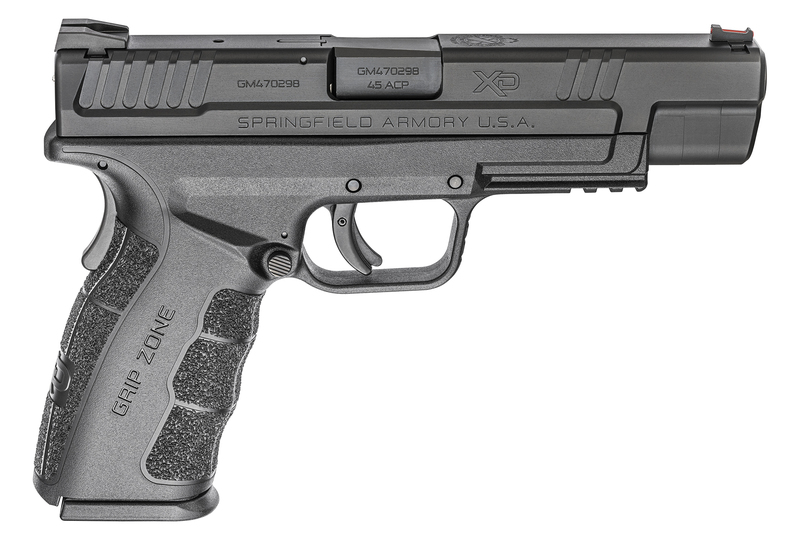 While it’s a double stack design, it’s not too thick to carry like so many of Springfield's competitors’ models. Measuring just 1.2 inches wide, it is barely wider than single stack pistols with far lower capacity. A pistol with a healthy sight radius is easier to shoot under stress, and that’s why they've chosen to fit the Mod.2® Tactical Model with a full five-inch hammer forged carbon steel barrel. It’s treated with Melonite® to stand up to moisture, sweat, and other undesirable conditions over the long haul.
" I had a first gen XD that shot groups so well and fit me perfect. Traded it for a colt mark IV 1911 . And could not wait to get another double stack XD received this one and did not disappoint. It shot free hand at 25 yards 10 shots in 10 ring of 13 shots . Then shot at 50 yards again free hand at 5 31/2” balloons hit 3 of five . A lil practice and I’m sure I can print a smiley face at 25 yards again like my original XD. " " Awesome transaction. Made a few purchases from Kentucky gun co. They're great to deal with. Firearm is very nice as well. Better feel than other 10mm I have. " " The firearm arrived quickly to my local FFL dealer. I tested on an outdoor range with a mix of FMJ and Hollow Points with no failures. Coming from 1911 so more practice needed. " " Great shooter with a nice trigger. Thirteen rounds of .45 Auto. I have small hands so the grip is a little bulky for me but not so bulky that I can't fire it accurately. " " Very soft shooting and accurate with pretty much any load. The trigger is my only issue, a little spongy but this not a competition gun for , strictly range & home defense One thing to point out, which I was unaware, the recoil spring. It is not captive like the 4 inch models and is under some serious pressure when breaking down for cleaning. When I started to remove, it shot out and broke a jar on my reloading bench. After that, I really pay particular attention.... just a heads up. All in all, very happy with the purchase, delivery was fast and as always, easy when dealing with KGC "